Lead scoring assigns points to people in your CRM based on attributes that make them a better lead. Higher scores help your sales team determine quality and interest, focusing their efforts, and becoming more efficient. Scoring identifies when individuals show a lot of interest by interacting with your brand. Lead scoring comes in two basic types: demographic and activity-based. The contact is an employee of your company. Not in a position of authority to buy from you. Encourage your leads and clients to fill out as much information as possible through profile updates. You and your team then need minimal effort to enter additional data. You also want to work with a CRM that automatically researches a contact and fills in the data you don’t know. This information is extremely beneficial, as you can add relevant data that helps your sales team understand more about all your contacts. FullContact and TowerData are two data providers that can provide this service. This image show how you might set up rules for your business. The top rule removes someone with a company email address from automation and from the “hot contacts” reporting. Setting up demographic lead scoring rules. One important characteristic about activity lead scoring to consider is that the value of actions decays over time. Recent actions are more important than past actions. For example, someone reading an email six months ago is not nearly as valuable to you as someone reading an email today. If a lead watched a video about one of your products an hour ago, it’s more relevant to a salesperson than if that video was watched last week. 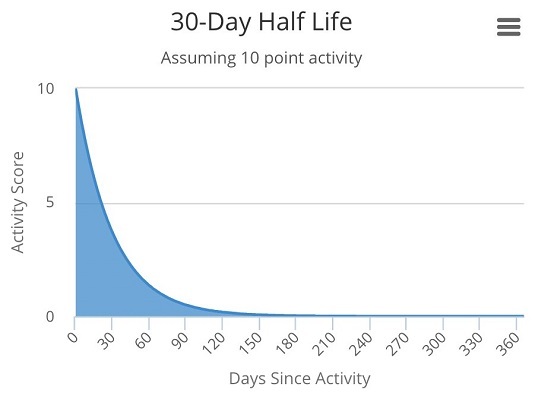 Decay rate of an activity score with a half-life of 30 days. Generally speaking, you want to set your half-life to two or three times your average sales cycle. Unless you have a very short “churn and burn” approach to your business, keep your half-life more than 30 days. Activity lead scoring decay is absolutely critical to have in your CRM. Without it, your data becomes cluttered and you’re unable to differentiate between high quality recent leads and leads that were important a long time ago but are no longer relevant.